← Alice in Steampunk World Cheshire Cat Pullip Announced! Fashion is nothing, if not cyclical the Bohemian look was originally popularized in the 1960s but made a major comeback in early to mid-2000s where it has gone in and out of style again a few times after being popularized by actress/style icon Sienna Miller. Bohemian style is starting to make a serious comeback again, Mattel has even recently released a Boho chic inspired Barbie called The Barbie Doll Look! Festival version which can be seen/purchased on Mattel’s Barbie Store here. With two hundred and eighty some odd Pullip releases we have never really had a Pullip release with Bohemian style clothing, the closest we have had is the little hippie Dal Lizbel who is still available for a steal on Pullipstyle here. 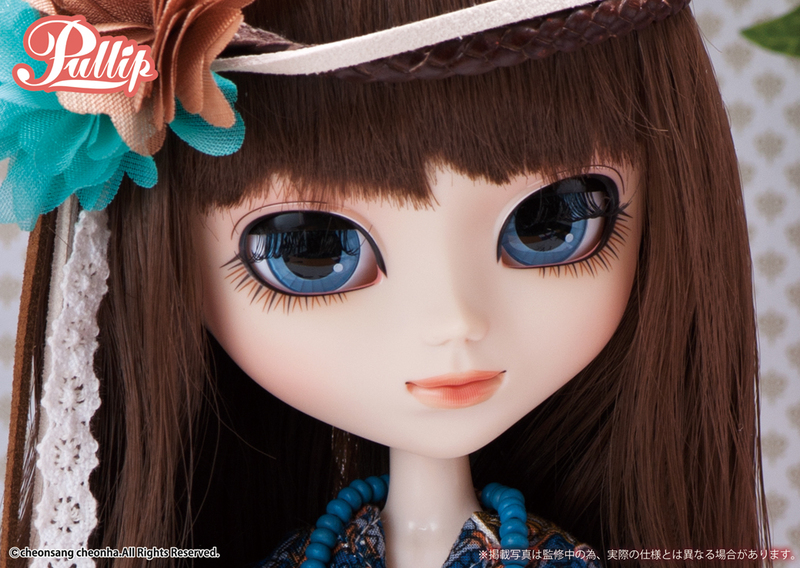 Pullip Taffy was announced via Groove’s blog last night, finally we have a boho chic Pullip! Pullip Taffy is to be released in October in Japan, she will be released one month later here in the US. 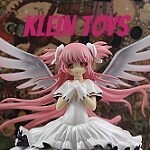 She is priced at 18,000 yen which is about $179 as of this writing. Like Pullip Cheshire Cat from the Alice in Steampunk World series, Pullip Taffy features the new two stage eyelids not a lot of details are available about this feature at this time. I believe the two stage eyelids are designed to be able to stay completely closed as well as partially closed but I’m not really sure, it’ll be interesting to see if it’s a completely new eye mechanism or not. beautiful melody of music, bright sun over over And I like is that this freedom I feel! 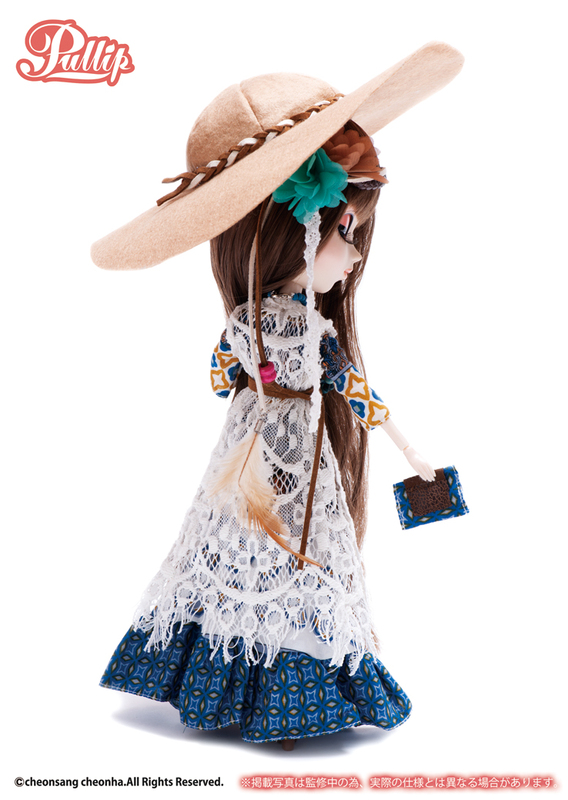 Pullip Taffy looks quite stylish in her boho-chic dress! An important aspect of boho-chic fashion is the colors, they should clash a bit and Groove managed to find a happy medium with colors that complement each other but also are a bit discoordinate with each other. I like the mix of bold patterns that were chose for her dress. Being a brunette myself, I tend to prefer blond or even fantasy hair but I think that the brown hair adds to her natural, bohemian look. Back view of the Pullip. I wish her purse included a strap of some sort, it would make it a lot more easy for Pullip to hold it. Pullip Taffy has a lovely face up, the colors are all very natural and I especially love her full lips with an almost an orangey undertone. I love her blue eyes, they complement her outfit really nicely. On the one hand I like that Groove included an accessory like a hat but on the other hand I think it’s a bit over the top and doesn’t really suit her that well. Oversized floppy hats are very Bohemian in style but the hat seems a bit ill-fitted, thankfully her hair accessories accentuate her look really nicely and the hat isn’t really needed to complete her look. Verdict? I like Taffy but it’s unfortunate that she is being released alongside Pullip Cheshire Cat in Steampunk World who I am absolutely in love with. While I will probably buy Pullip Taffy eventually my absolutely can’t miss doll for me is Pullip Cheshire Cat for this month. When/if I do get her I will definitely have to take a few pictures of her along with Dal Lizbel. I’ll be sure to update when she becomes available for preorder via Pullipstyle & JPGroove! This entry was posted in Doll, Pullip and tagged 2016 Groove, 2016 pullip, fashion doll, Pullip, pullip taffy. Bookmark the permalink. 2 Responses to Boho Pullip Taffy Announced! I got this doll “taffy” and I absolutely love her I am a doll collector but I’m very young I haven’t taken out of the box as it is a Christmas gift from my parents I really really really like her I also heard that she might have a new mechanism for eyes which I think that’s also a magnificent as well but overall I think that groove really made A good decision of making this doll she is beautiful and I love her outfit and I also have another pullip I have super Stella which I really hope that they can make a second version which I know that she is an exclusive, doll from comicon I’m not gonna go into a Stella but comparing them to I think taffy would one out of all dolls . Congrats on getting Taffy for Christmas! Taffy was originally announced as having the new eye mechanism but Groove announced that there was some type of factory error and that Taffy did not have the function after all but Cheshire Cat still did. It’s kind of disappointing about the eye mechanism but overall Taffy still looks to be a fantastic doll, I can’t wait to see owner photos of her. Super Stella is really great doll too, I wish they would make more Tokidoki dolls!